Karen began her artistic career as a young child in the city of Philadelphia, inspired by horses and nature; she majored in Illustration and Design at Hussian School of Art. She excelled in an eclectic array of mediums including, oils, acrylic, water colors, pencil and charcoal and expanded her knowledge and experience to stained glass and jewelry. Karen’s creations led her to reputable work with The Franklin Mint in Philadelphia and later, as Senior Prototype Artist at Breyer Animal Creations in New Jersey, where she has made her home. It was with Breyer that Karen expanded her talents as a teacher of art, teaching painting workshops and demonstrations at Breyerfest in Lexington, KY, as well as with the Equine Affaire in Massachusetts and Ohio. 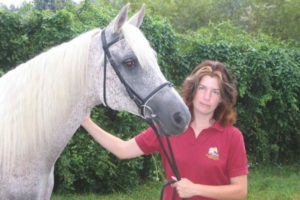 Karen is a founding member of the New Jersey Equine Artists’ Association and has displayed and sold her work at various events, including the Fairhill International 3-Day Event, Dressage at Devon, and Ludwig’s Corner Horse Show. Karen is currently the owner of Two Blue Dingoes Art and Glass and continues her work with Breyer. Karen derives her inspiration from her many equestrian disciplines such as hunters, jumpers, dressage, western pleasure and carriage driving, but it is Karen’s love of nature, that one will see reflected in every piece of her art. Her goal is to create pieces, which move the heart and create a space within the soul.